Hello Dealsnloot Readers,looking for hassle free online payment spot? ChargenMarch is the perfect place for you. We, at CAM, offer seamless experience in online recharges. With us, you can go for mobile recharge, DTH recharge& Datacard recharge for all the operators available within less than 2 minutes. Currently They Offering 10 Rs. Per Refer Wallet Cash.Apart from this, we also provide you the option to load up the money & forget using the cards with CAM Wallet a.k.a CAMllet.So Hurry Grab This Loot Recharge Site Loot Deal. Update – The website’s server is down now. Try later Again And Again.The site is loading slow due to heavy traffic so keeping trying or try again later. How to earn Rs. 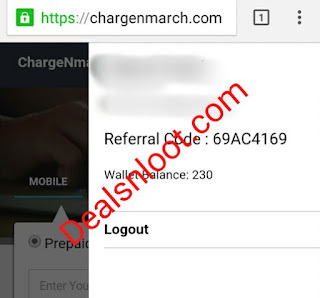 10 per referral from ChargenMarch Loot ? Click to register and enter all the required details. Verify your mobile no with OTP. Minimum recharge is Rs. 10 only. Offer seems valid for limited time, be aware and hurry up.